Click this link to read a fun article called Stop Sausaging Around from See! Travel Mag. You put the smergle in the kefuptnik, hit the guntraager button, unt out comes the wassenwitchit in one long line. Yumbo. I love sausages so much I recently spent $250 on a genuine sausage maker. I even bought proper pig’s intestine to form the casing of the sausages, not that horrid plastic stuff that commercial sausage makers make. Then I went and sourced superb pork belly from the best butcher in Melbourne, and added in all the spices I wanted, following the recipes I had downloaded from the internet to the letter. Mein Gott In Himmel! Do you guys have ANY idea how bad sausages are for us? They are little tubular fat and cholesterol BOMBS! The home-made heart-stoppers were bloody delicious, mind you. Actually, reading back, I think the only thing I can say is “Don’t play the sore liver sausage” you wuss. Hang the risk, get sausage making again. Hmmmm. Tempting. Anyhow, how brilliant is it to have a culture like the Dear Old Deutsch where sausages are so prevalent they even have sayings about them? Actually, there’s an Aussie saying called “Sink The Sausage” come to think of it. Not to mention “Hide the Baby Salami”. They mean about the same thing. I’m sure you can work it out. And now I’ve included them in this article, you can guarantee my story on sausages won’t get Freshly Pressed. Hey ho. Defeats the whole purpose of making them. The trick to the puuuurfect sausage is to cook it slowly, turning constantly, over a low heat, until it is thoroughly cooked through and gently browned. Never pierce it with a fork or knife tip. Apart from losing lots of lusciousness, red hot pork fat in the eye hurts. OK – I want to know YOUR favourite sausage, Dear Reader. Lincolnshire? Cumberland? Chicken with Chives? Duck with orange and sage? Italian? Or your favourite really silly sausage story. Or your best home-made sausage recipe – and if it’s good, I promise I will make a batch and post photos. Yes, I think I will make some more sausages. Life’s too short. If I suddenly stop posting, you’ll know I have had a coronary, and life got even shorter. F*** it, eh? 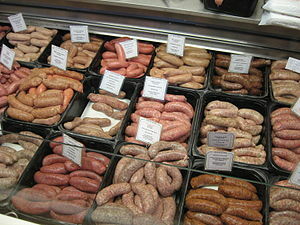 Related nonsense about sausages for your delight and delectation. Lancaster County’s best ~ John F. Martin and Sons Smoked Sausage. It’s a treat I allow myself for lunch every two or three weeks. http://farmmarket.shady-maple.com/index.cfm?fuseaction=product.display&product_ID=68 And it must be eaten with horseradish ~ not the creamy sauce stuff, just 100% shredded horseradish packed in brine. This is one of the truths of life that I learned from my father, and he from his mother before him. There’s nothing like family tradition! That makes me a great big sausage. Oo-er missus.